Sometimes I’m lucky and get to be both at the same time — I helped lead the KeepDCUnited effort to get the DC Council to work to prevent DC United from leaving town, and I recently watched an Athletic Bilbao — Atlético Madrid match from the Basque President’s box at San Mamés in Bilbao. The Federation election provides another happy opportunity for my worlds to collide. 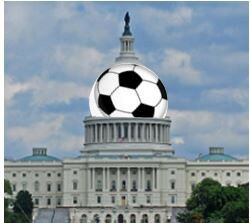 Soccer America’s Paul Kennedy explained the basics of the upcoming election. At their February meeting the National Council of the US Soccer Federation will elect a president and vice-president. The voting is by secret ballot and winning requires a majority. If no candidate receives a majority on the first ballot, voting continues until a candidate receives a majority of votes cast (in 1924 it took the Democrats 103 tries and 16 days to name a presidential nominee, so that’s one record to chase). The candidates run separately, and each serves a four-year term. Each person is limited to serving three terms, and both positions are unpaid. Candidates must submit their intent to be considered 60 days before the election, be nominated by three members, and submit to a background check. The votes on the National Council are weighted by interest group — the Youth Council, Adult, and Professional Councils each get 25.8% of the vote, athletes 20%, and others like supporters’ groups get the remaining 2.6%. The Federation’s complete bylaws go into more detail, but that’s the gist of it. Winning is about National Council votes that add up to 51%. Not total support among all players or fans, not the support of your mom, but 51% of the National Council votes. This sounds obvious but a lot of smart candidates miss this fundamental. Obama won the nomination in 2008 by focusing on accumulating delegates — the deciding votes for the nomination — rather than on total votes in the primaries. Trump won the White House by accumulating the most electoral votes — the deciding votes in a presidential election — even as he lost the popular vote by around 3 million. The American public supports stronger gun laws, but the key voters in key Congressional districts, and thus the Representatives from those districts, do not, therefore gun laws remain lax. Having the overwhelming support of the American Outlaws but not a lot of support among athletes may get you a lot of attention on social media, but probably doesn’t matter. The winning candidate can basically ignore the people who fill the stands, buy the swag, and watch the games and still easily win. Voters support winners. This is true in every election (and pretty much everything else; we tend to like to be seen doing what those we like seem to be doing, and we hate to be seen to be doing something else). That means that candidates who appear to be winning may have a better chance of actually winning. Candidates for elective office often announce their races with well-accepted proxies for winning: money, organization, and endorsements. All of these things say “I have a lot of support already, much of it from people like you or from people you like” and tend to engender more support. Kyle Martino did a good job with this when he announced he was running with letters of support from David Beckham and Thierry Henry, an online presence, a platform, and a plan. Similarly, Eric Wynalda has declared he has more than 20 “declarations of support” behind his run. This isn’t always the case of course — Hillary Clinton lost the last two elections she was inevitably going to win (to Obama and Trump), and Trump won a nomination and election he was going to obviously lose, but the existence of a few black swans does not mean that most swans aren’t white. If professional players, youth club representatives, or others believe their peers are lining up behind one candidate, they are likely to fall in line as well. There is an old saying in fundraising that no one wants to be the first person to step into the middle of a room, but no one wants to be the last. It is important to define the nature of the campaign, yourself, and your opponent early and often. If you’re a soccer insider you need to define the race as one that corrects an otherwise strong system from within and paint outsiders as a greater threat (US Soccer vice president Carlos Cordiero, and longtime insiders Paul Lapointe and Steve Gans fall into this category). Change may be needed, but by definition those on the inside are pretty well positioned to create that change because they know the system and people. Further, bringing in someone new would be even worse — now is not the time for amateurs or people who have to learn on the job. If you’re not a traditional candidate then you need to define the race as a change election. This is one way Obama beat Clinton in 2008, and can be how former professional players like Martino, Eric Wynalda, and Paul Caligiuri can successfully define the race. Having defined the election in terms that benefit them, the candidates then need to define themselves and their opponents. The insiders need to talk up the institutional skills needed to navigate a complex system while still conceding that change is needed (they may be able to take advantage of Trump here — “we’ve seen what happens when we succumb to the urge to elect someone who promises to burn down the house — the house tends to burn down; we need boldness measured with experience”). They also need to differentiate themselves from other insiders — as the most outsider insider, the insider with the greatest ability to create change, and so forth. The outsiders need to talk about their unique ability to create change with a whole new perspective, balanced with the skills needed to succeed. Having isolated half the field as being part of the problem, the outsider candidates need to differentiate themselves from each other — the most insider outsider, the best relationships, the least afraid to be bold, and so on. Again this is something that Martino is doing well — he leads with “I’m a soccer guy” thereby highlighting the difference with the insiders who are not, and saying he will hire the business guys thereby keeping the best of the status quo while bringing needed new perspective. Voters want to know you share their values and concerns. Voters don’t want you to understand, or “hear them” or anything else that sounds like your parents explaining why you can’t drop out of high school to be a roadie for Cheap Trick. Voters need to feel that you’re one of them. Bill Clinton felt our pain, Donald Trump shared America’s anger, and Obama embodied our hopes; they didn’t understand us, they were us. As a fan I don’t want the people leading US soccer to understand my disappointment — I want someone who shares it. In a change election this advantage goes to the outsiders — Caligiuri brought the US back to the World Cup, he of all people knows what missing Russia means. He is an outsider who made the current crop of insiders possible by scoring the goal against Trinidad and Tobago that sent the US to the World Cup in 1990 and starting the string that ended with the loss at Trinidad and Tobago. Having established common ground, voters want you to listen rather than talk. One way successful candidates create this connection is by delivering a short set of principles or values, major premises from which minor premises and conclusions can be drawn. Candidates share these premises and ask voters to help achieve them — “I believe in fairness, together we can make this fair, will you help?” This is very different than presenting a fully-baked plan with which voters might agree but into which they have had no input. Don’t give me your blueprints for my new house — tell me you know how important it is for a place to feel like home and ask what that means to me, then show me the blueprints. Voters want to trust you can do the job. We vote for people to do things we don’t want to do — if we wanted to run things we wouldn’t sub running things out to other people, we would do it ourselves. Most people most of the time mostly view politics like a toilet: They just want it to work. If your toilet is running you don’t call several plumbers to debate the types of pipes or relative value of brands — you call someone with a wrench and tell him or her to make it work. The members of the US Soccer Federation’s national council have jobs, families, and responsibilities tied to their roles in US Soccer. They want to elect someone who they trust can make soccer “work” (the women need to keep winning, the men need to start winning). This means that the insiders calling for change may have an advantage, and that outsiders need to show they can play well with others and actually get things done. The product on the field should be exciting and dramatic, the stuff in the offices should be dull and quiet; the problem now is that it’s the reverse.